Tre’Dasia Tucker (front), who has cerebral palsy, has plenty of support from her brother, Celtics guard Terry Rozier (far right), and the rest of her family. They are, from left, brother, B.J. Carter, grandmother Amanda Tucker, mother Gina Tucker and Terry’s son, Justin Rozier. 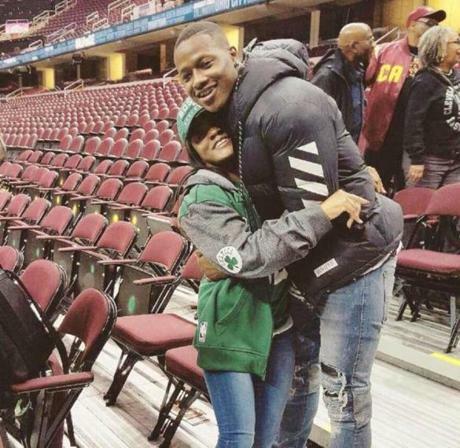 After Terry Rozier scored 21 points in the Celtics’ Feb. 11 loss to the Cavaliers, his older sister, Tre’Dasia Tucker, waited patiently for him in a hallway in the bowels of TD Garden. It was the first time she had seen him play in Boston, the first time she’d heard Celtics fans howl for him, and now she was excited for them to go to dinner and talk all about it. Rozier drove his sister to one of his favorite restaurants, Strip by Strega, and when they arrived at the Back Bay steakhouse, Tucker asked her brother to grab her walker. She has cerebral palsy and is unable to walk without assistance, and even then she can usually travel just short distances. But Rozier shook his head. He reminded her that she was with him now, and that nothing had changed from when they were teenagers. Tucker, 26, was worried she would embarrass her brother. She protested, but it was futile. So the 6-foot-2, 190-pound point guard put his older sister on his shoulders and gave her a piggy-back ride from Arlington Street to their dinner table. Rozier’s mother, Gina Tucker, was 16 years old when she gave birth to Tre’Dasia prematurely. The girl weighed just 2 pounds, 14 ounces and was unable to breathe on her own. She was connected to heart monitors and a ventilator and remained hospitalized for several months. The family was confident she would live a normal, healthy life afterward, but at 1, she was still dragging her legs when she crawled. She was ultimately diagnosed with cerebral palsy, a disorder caused by brain malformations that affect movement and muscle coordination. There is no cure, but there are treatments that can make life more manageable, and Tre’Dasia and her family have tried so many of them. She had her first surgery at 3 and was put in a body cast from her waist down to help straighten her legs. That was the first of seven procedures over an 18-year span. She had tendon-release surgeries on her arms to create more range of motion. She had screws inserted into her toes to help her stand up straighter. She had procedures to flatten her feet so she did not just walk on her tiptoes. She had surgeries to help keep her knees from knocking. There were other challenges, too. Gina initially raised Tre’Dasia and Terry in a hardscrabble neighborhood in Youngstown, Ohio. 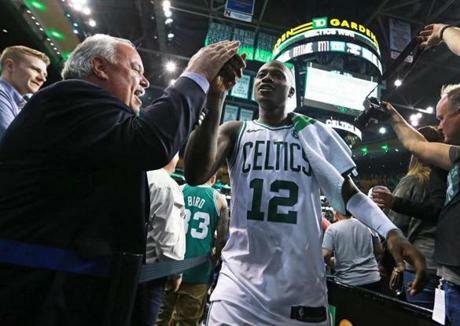 Terry’s father, Terry Rozier Sr., was arrested for aggravated robbery two months after Terry was born in 1994 and was imprisoned for eight years. Less than a year after being released, he was charged with kidnapping, robbery, and involuntary manslaughter, and he is still in prison for those crimes. 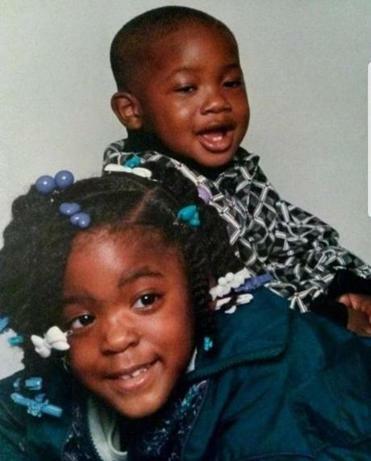 Terry Rozier (back) and his sister Tre’Dasia Tucker as children. In 1995, when Tre’Dasia was just 4, her father, Richard Taylor, was shot and killed while sitting on the steps of a Youngstown apartment complex. Gina Tucker kept three guns as protection, and a former boyfriend once even sprayed shots through the walls of her home. Youngstown was not a place with much hope, and Tre’Dasia needed hope. So Gina brought her to live with her mother, Amanda Tucker, in the Cleveland suburb of Shaker Heights. Terry joined her there when he was 6. The siblings shared a room in their grandmother’s house and slept on bunk beds, and they fought constantly. Terry wanted to be back in Youngstown, and Tre’Dasia did not want Terry around. When Terry was especially mad, he would cut the hair off of his sister’s dolls. But their anger never lingered. They didn’t have a basketball hoop outside yet, so Terry would practice by throwing rolled-up socks into an egg crate in their bedroom, and Tre’Dasia would toss them back so he could try again. When Terry had youth-league football practices, he completed his sprints so quickly that coaches thought he had skipped some of them. But Tre’Dasia was watching, and she would chime in. When Terry was a teenager, he became more of a guardian for his sister. If she was bedridden after surgeries he would help turn her over and get her dressed. At family outings, she usually ended up on his shoulders. Once when Terry was in middle school, he put Tre’Dasia on his back as they navigated a haunted house. At the end he had to run up a small hill while they were being chased, and Terry did not appreciate how close some scary clowns were getting to his sister. “I was ready to fight one of them,” Rozier said, his face straight. Tre’Dasia laughs when she recounts that outing. 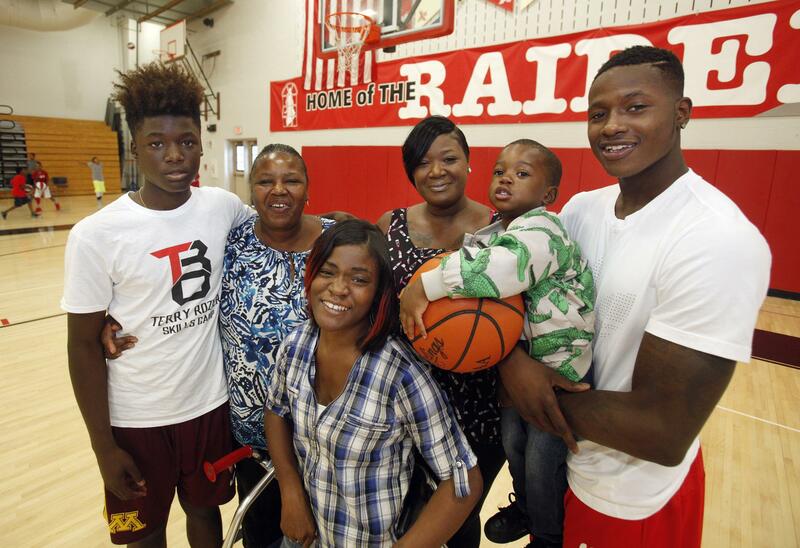 Tre’Dasia Tucker (left) and Terry Rozier grew up in Shaker Heights, Ohio. Nevertheless, Terry, two years younger than his sister, remained relentlessly protective. One day Tre’Dasia came home from school crying because some students had been teasing her. The next day Terry found the kids and calmly and sternly made sure that they did not tease his sister again. Another time, a fight started between two boys in the school cafeteria, near where Terry and Tre’Dasia were sitting. “Terry just let the guys know, ‘You can handle your business, but my sister’s right here, so you might want to move over there, because if anything happens to her, it won’t be good for you,” Tre’Dasia said. There were days Tre’Dasia woke up and dreaded going to physical therapy. So Terry sometimes went with her. Once, the group was using dance steps to practice movement, and Terry shyly showed off his cha-cha. Sometimes he went along to her United Cerebral Palsy camp, even hopping into a pool to join the exercises. The family never let Tre’Dasia’s condition serve as an excuse for what she could not do. She had always wanted to go roller skating, for example, even though that was not physically possible. So one day they put wheels on her walker and took off her sneakers, and she slid around the rink in her socks. When Terry went to the University of Louisville in 2013, Tre’Dasia was wary of burdening him with her problems as he chased his basketball dreams, so she sometimes hid them from him. At one point she was having a procedure in which medicine was injected into her spine, and she needed a stomach pump inserted. There were complications when the pump was removed, and she ended up in an intensive-care unit for nearly two weeks. But Terry was not informed, and when he found out, he was furious. After one Louisville game, Tre’Dasia had come down from the wheelchair-accessible area to the court with her family to see Terry. When it was time to leave, he put her on his shoulders to carry her back up the arena’s stairs. He was tired and still sweating from the game. Cardinals coach Rick Pitino asked if he needed assistance. And up the stairs he went. Tre’Dasia has required around-the-clock care for most of her life, but early on it became clear that she was most comfortable with her mother. So Gina became certified as a home health aide and was essentially paid by the state of Ohio to be her daughter’s caregiver. It is hardly lucrative, but it was important for Gina to be there. Since Terry is now in Boston, much of the extra responsibilities fall to their younger brother, B.J. Carter, who is still in high school. Tre’Dasia has become increasingly independent, though. Her goal is to move out on her own by October, and her mother is at once proud and reluctant. For now, Tre’Dasia works full-time from home as a booking agent for Marriott, and she is about a year away from earning her bachelor’s degree in English at Cleveland State. Terry sends his sister money for books, and at the end of the semester she texts him a picture of her report card to say thank you. Tre’Dasia is planning to take the LSAT and would like to become a lawyer. When she enrolls in classes each year, she usually does a dry run of the campus with Gina and B.J. to see which buildings she can navigate on her own and which will require assistance. They figure it out together. Tre’Dasia has overcome obstacles and accomplished more than most doctors ever thought she would. But she does not want anyone to think it has been easy. That is usually when she calls or texts Terry in Boston. Sometimes they’ll just send Snapchats of movies they watched together as kids, or screen-grabs of Michael Jackson songs they’re listening to. Little things like that make her feel better. Other times, she seeks guidance. Terry explains how important it is to stay patient and focused. He explains how he did not reach his goals overnight, either. The Celtics drafted Terry Rozier in 2015. Rozier has been a revelation for the Celtics in the playoffs, averaging 17.4 points, 5.6 rebounds, and 5.6 assists per game in place of the injured Kyrie Irving, helping bring Boston within two wins of an improbable NBA Finals appearance. It has been a joy for Tre’Dasia to watch. She wears Celtics gear to classes at Cleveland State, but doesn’t really tell anyone about her famous brother. 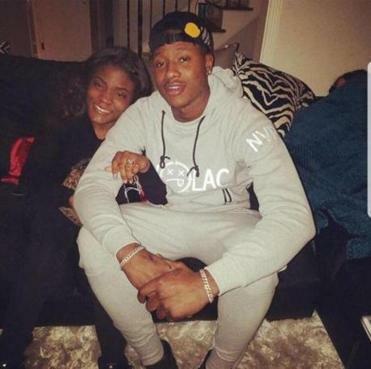 This weekend, when Rozier returns home for Games 3 and 4 of the conference finals against the Cavs, though, his sister’s rooting interest will be impossible to hide. Rozier and his mother are in the process of founding the Terry Rozier Foundation, which will be centered on helping inner-city children who have disabilities or behavior issues. And Tre’Dasia, who has spent much of her life seeking assistance, is eager to now be the one who offers it. Tre’Dasia Tucker attends Cleveland State University.